Reliability, refinement and rugged good looks as standard. Whether it's grafting in the field or chauffeuring the kids to school, the Nissan Navara has it all. The vehicle's powerful and efficient engine, strong chassis and stylish interior offers passengers the comfort and renfinement of Nissan's crossover range. Improving refinement and delivering a Crossover-style driving experience was a key element of the Navara’s development. To help achieve this without compromising the vehicle’s acclaimed off-road ability, Nissan designed an all-new five-link rear suspension system for the Double Cab model, providing significantly improved ride comfort and handling, and is 20kg lighter than the previous leaf spring layout. The Navara’s new 2.3-litre dCi engine is up to 24 per cent more efficient than the unit it replaces and is the cleanest and most economical in its sector. Available with two power output options, 160hp and 190hp, the range-topping version introduces twin turbocharging technology, which is the first time for Nissan in this segment and delivers exceptionally low running costs coupled with substantially reduced CO2 emissions. Great engines need great transmissions, and once again the new Navara excels. The latest generation model will launch with the choice of two or four-wheel drive and the option of a standard six-speed manual or a seven-speed automatic gearbox. As customers have come to expect, the new Navara is as capable off-road as it is on-road. The four-wheel drive system builds on the strengths of the design fitted to the previous generation model, and delivers surefooted traction over rough terrain. Designed and engineered for the specific requirements and preferences of the European market, and also manufactured in Europe, the Navara in both its King Cab and Double Cab guises has been designed to deliver a rugged yet sporty overall style, with a mix of convex and concave surfaces providing a dynamic and bold look. Nissan’s signature V-motion grille and boomerang shaped LED daytime running lights provide distinctive Nissan design cues. Knowing that pick-up owners need their vehicles to earn their keep, the Navara’s load carrying and towing ability across the range is improved. With payload ratings now in excess of one tonne across the range and an impressive towing capacity of 3,500kg, the new NP300Navara is ready for the toughest and most demanding of jobs or leisure pursuits. In-line with Nissan innovation, the new Navara introduces an array of new in-car technology. In a sector that has traditionally been slow to adopt the very latest in comfort and safety features, it sets a new benchmark for affordable in-car technology. Mid-range models receive Nissan Intelligent Key system with engine start/stop button and a 5” HD full colour TFT screen, automatic air conditioning with dual zone climate control, rear colour reversing camera (shown in the rear view mirror), side steps, electric folding heated door mirrors and rear privacy glass. Higher spec models are fitted with the NissanConnect 2.0 7” touchscreen satellite navigation and entertainment system. This incorporates features including DAB digital radio, a rear colour reversing camera, Bluetooth audio streaming, app integration and live traffic updates. Around View Monitor and Forward Emergency Braking (FEB) – both highly acclaimed Crossover safety features – are unique to the pick-up market and provide customers with more advanced levels of technology than ever seen in a pick-up. 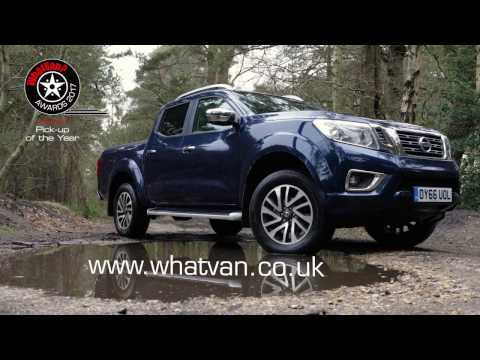 Further safety and convenience features include Cruise Control, Hill Descent Control (HDC) and Hill Start Assist (HSA), all of which have been developed to meet the specific demands of Navara owners, as well as keyless entry, rear camera and parking sensors.